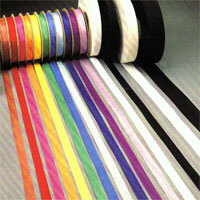 SEAM BINDING: “HUG SNUG ½” SEAM BINDING” is available in 200 colors and ¼” DRESS RIBBON in 21 colors. All are in stock at our New York Garment Center warehouse. This versatile product is 100% washable and dry cleanable rayon with a woven edge and is put-up 100 yards to a roll. Dye to match color capabilities exist both in Asia and the U.S.